He’s the guy who eats weird stuff—very weird stuff, like rotten shark in Reykjavik and giant fruit bats in Samoa. You may have watched him on Bizarre Foods or Bizarre Worlds on the Travel Channel, read his column in Delta Sky magazine, or know his singular travelogue: The Bizarre Truth: How I Walked Out the Door Mouth First . . . and Came Back Shaking My Head. 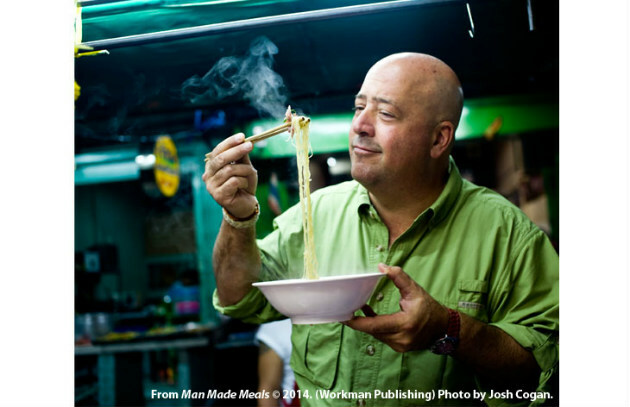 What you may not know about journalist, author, teacher, chef, and TV host Andrew Zimmern is that he graduated from Vassar with a joint degree in history and art history (he wrote his thesis on daguerreotypes). And he may be the only major food celebrity to have a motto in Latin: Semper exploro, mysterium expecto (“I always explore, I always expect mystery”). What are the three strangest foods you’ve ever eaten? Giant fruit bat from Samoa. It has a six-foot wingspan and tastes extremely gamy. Eat it grilled with ginger juice—an Asian flavor and disinfectant. Giant porcupine from Botswana. It weighs eighty pounds and takes painstaking hours to pluck off the quills. There’s an inch-thick layer of fat just below the skin, which the tribesmen grill over a wood fire with a layer of ash on top. What results tastes like the nugget of fat at the narrow end of a New York strip. Totally amazing. Palolo. It’s a tiny worm that lives in coral beds fifty miles off the coast of Samoa. You scoop it off the water by the hundreds and eat it smeared on bread. Think foie gras crossed with iodine with an exquisitely creamy texture. Why should a man know how to cook? As a guy, I’m lousy at expressing my feelings. Cooking is as touchy-feely as I get. There’s nothing more honest than cooking, and when I do it, I can show people what’s in my heart. It’s also my time to Zen out. What’s your go-to dish when you’re by yourself? Shrimp and grits or fish and grits. It’s leftovers raised to the level of high art. Or after I’ve been hunting, I like deer liver alla veneziana (with caramelized onions). It’s quick and easy, and deer liver has a cleaner taste than calf’s. Braised duck legs. You brown them in fat and cook for an hour and a half with vegetables, tarragon, and red wine. You serve them with spaetzle or pasta with wild mushrooms. I made it when I was courting my wife and let’s just say that that evening worked out really well. 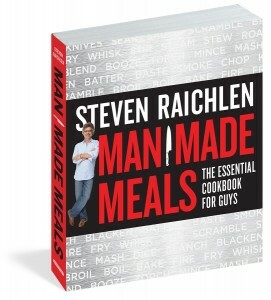 Three things every guy should know how to do in the kitchen? Make bread. There’s nothing more spiritual or elemental. It’s a rite of passage with my seven-year-old. The first time we made bread together, my son realized that not everything you eat has to come from a supermarket. Note to dads: Bread takes several hours to rise and young boys have short attention spans. You may want to have some dough that’s already risen as a swap-out to keep the process moving. Cook fish. For some reason, every guy who’s been to a sushi bar thinks all fish should be served undercooked. The fact is that most fish does not taste best raw or even rare. This is particularly true in my part of the country (Minnesota), where we eat a lot of walleye. Learn to cook fish and learn to cook it through. Learn how to light and use your grill. You need to know how to drag meat back to your cave and cook it. If you don’t know how to grill, you’re doing a great disservice to mankind. Chile peppers. I’m a hot freak and I need to have that big explosion of flavor. At any given time, we have thirty different chile condiments—most of them homemade—in the refrigerator. Miso (a tangy paste of cultured soy beans and grains from Japan). It’s sweet, salty, and loaded with umami flavors. I use it for everything from curing salmon to grilling chicken. I prefer imported Japanese miso—it has a fermented quality that smells like a cross between the best mushrooms you’ve ever tasted and the dirtiest gym socks. Pickles. Kimchi. Pickled cabbage. Sauerkraut. I love fermented flavors. With chiles, pickles, and miso, you can take over the world.